WILLIAMSBURG, VA -- There's a certain amount of pressure you accept when giving someone a first shot at greatness. After all, there are only so many immediate success stories. Not many baseball pitchers struck out the side in their first inning pitched. Only a few football players scored a touchdown the first time they carried the ball. And probably only a handful of hockey players ever reached the back of the net with their initial slap-shot. Even Tiger Woods didn't come close to winning his first professional tournament. The Colonial's famous 6th hole, 'The Abyss,' features a vast wetland between tee and green. Many a golf ball has been swallowed. The odds are against newcomers -- it's tough to succeed at the highest level on your first try. It's probably more likely you'll strikeout or fumble, or maybe even leave a three-on-one heading the opposite direction with your goalie helplessly exposed. There's a reason why experience is valuable. Similarly, there probably aren't many golf course architects who've hit pay dirt with their first projects -- and the stakes are arguably much higher for any owner selecting someone new in the golf design business, with the incredibly high cost of land these days (not to mention construction costs). Counting on a fledgling to build a great course on his maiden venture takes a lot of guts. 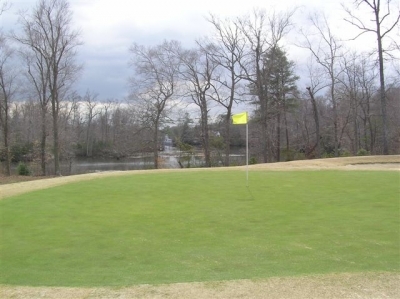 Luckily for owner Francis Fenderson and The Colonial Golf Club in Williamsburg, hiring Lester George to mold this beautiful piece of land into an excellent golf course was the right call. It was George's first solo design project (he'd apprenticed in a design firm for several years before), but he definitely stepped up to the mound ready to toss that first pitch. 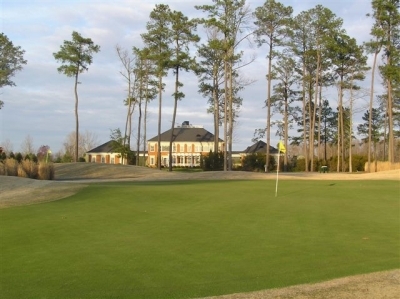 Since that time, George has put his signature on several award winning projects in the mid-Atlantic, the most noteworthy being Kinloch Golf Club near Richmond, which won (2001) for 'Best New Private Course' from Golf Digest (and placed high up on the list for best American course built since 1960 by Golf Week -- not bad, considering over 11,000 golf courses have been constructed in the interim). 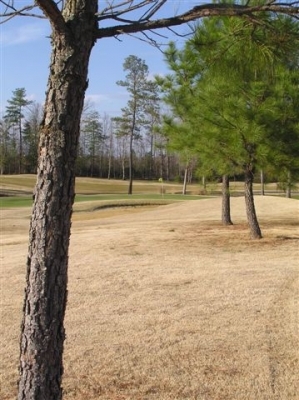 The Colonial offers plenty of room to drive the ball, but if you're horizontally challenged, you will meet some trees. For The Colonial, George had already done most of the legwork prior to its construction, so maybe it wasn't such a stomach testing decision for Fenderson after all. George foresaw the promise of the property. "I'd searched the area for a good piece of land, and happened to come across this 210 acre tract owned by an estate," he elaborates. "I'd arranged with the owners to purchase the property and build a golf course, yet I needed to find someone to develop it, and then I'd do the design work." "I told Francis about the idea, and took him out to see the property. He liked it so much, we worked out the details that same day -- and the rest is history," George said. History indeed. The Colonial is one of the newer vintage layouts in the Williamsburg area, having opened in 1995, but the course's feel is much older. It's rare these days to find a golf course out in the country without a single house or condo in sight, with greens very close to tees and a layout that shouts 'Walk me' to golfers playing it. The Colonial is such a course. George also says The Colonial's beautiful landscape came with some sizeable challenges: "Once we started work on the course, we found the property contained forty-four archeological sites, seven of which required phase two investigation (which subsequently determined they were significant). For those seven areas, we couldn't cut -- only fill." 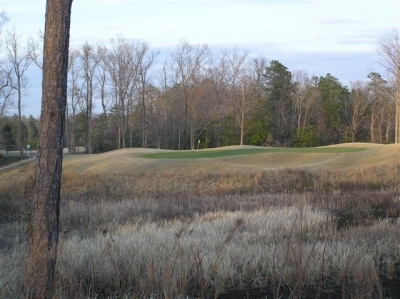 Early spring reveals the contrasts in color and grasses on the short par three 8th hole. "Adding to that, we had three wetlands crossings inside the resource protection area (RPA) on numbers five, six and fifteen--those required special exception permits from James City County and the Chesapeake Bay Board. Finally, we found some 2-300 year-old Specimen laurel onsite that we tried to preserve. It made for an interesting routing exercise, believe me," George said. He must've routed it well, however, because they found extra room for three more holes (a par three, four and five) to serve as 'practice' links for The Colonial's golf academy. It's a heckuva way to make the most out of your acreage. With the amount of thought that went into building the layout, it's not surprising The Colonial Golf Course is very much a player's venue. Head Golf Professional Mike Hayes describes it this way: "We pride ourselves on providing the best golf experience that we possibly can. We're out here in the country with just you and the golf course, and we're also the only facility in the area that books ten-minute tee times. We'll do whatever it takes to make sure everyone goes away happy." Hayes says the course's difficulty lies in the tee shots. "When you talk about the average player, the one thing they have the most difficulty with is driving the golf ball. Our course is really not that difficult with second shots or mandating forced carries, but you have to drive it well to get a good score here. 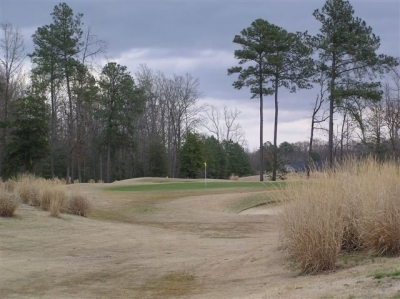 If you play from the proper set of tees, this course won't kill you." The par five 5th hole features an 'abyss' of its own, but this time it's in back of the green and out of play. That's true. There're enough tight fairways, wetlands and water on the layout to place it in the target category--or, perhaps more appropriately, the 'placement' golf course category. It's not necessarily penal if you miss the target, but improper placement will leave a more difficult second shot. Not surprisingly, it's a course that requires a couple times played in order to determine the best angles to work from. Strategy is key. Like most traditional style courses, the greens are small to moderately sized with some testy undulations. 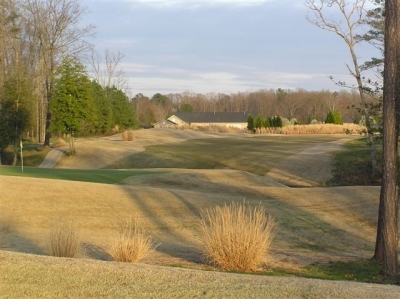 Hayes says "you won't find any acres sized greens here, but they're more than adequate for the type of course we have." The layout stretches to 6885 (par 72) from the back tees, and if you add a fair amount of downhill tee shots, will tend to play some shorter than that. Three of the par fives are easily reachable for long hitters, and there are a couple outstanding short par fours. Throughout the course, George highlights the property's best features and emphasizes them in a near perfect balance of nature and golf. Yet another classic golf layout in Williamsburg. Turning to the course, Hayes says the front nine plays (on average) two strokes tougher, and that seems accurate. It's actually a few yards shorter than the backside, but seems to bring more trouble into play. All of The Colonial's par fives are arguably reachable in two, including the 18th hole. You'll start off with a 380 yard par four, straight on, with a bunker left and ample room to drive it. Trees squeeze the fairway on both sides closer to the green, so once again, proper placement is necessary for a good angle to shoot at the putting surface. Three's the number one handicap hole, and it plays similar to the shorter par fives on the course. Not a single fairway bunker deters you, but your drive still must find the fairway for any chance to reach the green on your second shot. If you're left, trees may block your view, and a wetlands filled ravine runs down the left side of the latter part of the hole. Bunkers guard the right approach, so here's a 451 yard par four where you'll need two long and accurate shots to reach the green. Six is probably The Colonial's most famous hole -- or should I say, the most notorious. Nicknamed 'The Abyss,' the view from the tee is panoramic, with water and wetlands covering the distance to the green (189 yards), but it looks much farther. If you manage to hit the green, the fun's not over, with an undulated surface that'll make side hill putts nearly impossible to stop near the hole. One unique feature -- there's a 'Cussin' box in back of the green that takes donations to charity, should you feel guilty for your blasphemy off the tee. If players are honest, it probably fills up frequently. Turning to the back, eleven's one of the best holes on the course. 371 yards from the tips, take the starter's advice and don't use a driver on this hole -- if it's dead straight, it'll roll down a hill into the rough. If it's right, you're in a bunker, and left, you're in the rough and possibly blocked by trees on the approach. Second shots must carry a small ravine, and the green looks (and is) pretty small. If you're long, good luck stopping the ball on the green with a chip. Precise iron play is demanded on The Colonial's par threes. They're not long, but if you miss, you'll pay. Thirteen is another thinking player's par four. 412 yards and slightly downhill off the tee, there's a lake that juts into the landing area, which long hitters may be able to reach with a driver. Hayes says he likes this hole because "it doesn't matter how long you hit the ball off the tee, you're still going to have 150 yards for the second shot. The lake makes everyone equal and neutralizes the advantage of long hitters." The prize for most aesthetically pleasing tee shot goes to hole fifteen. First off, you'll take a lengthy cart bridge (over wetlands) to get to the tee from the fourteenth green -- then you'll tee off over a ravine. Looks scarier than it plays -- probably only 150 yards to the other side. Eighteen's a terrific finishing hole, 493 yards of par five. Another deceptive tee shot, you're shooting over the same lake you saw on thirteen. Again, it's probably only 150 yards to carry it, but it looks much farther. If your nerve allows you to cut off some of the lake (it's a slight dogleg left), you'll have a chance to go for the green in two. No greenside bunkers wait for stray iron shots--but if you miss the green, it's hardly a sure up and down. Upon finishing the round, highly recommended is a visit to the Colonial style brick clubhouse, where you'll find the Mill Creek Inn restaurant. Casual but elegant dining just seems to fit the theme of the club -- and you'll also be able to look over the golf course while you eat. Hard to find a better sight. As shown by the 1st hole, there's run-up room to most of the greens -- but they're also well bunkered. The Colonial Golf Course does require a 20 minute drive to reach it (from the historic district), but the peace and solitude you'll find there makes it worth it. The quality of the course also proves one thing -- some first timers are up to the challenge. Remember that the next time you call on a rookie in a pinch. Coming to Williamsburg to play some great golf or tour some of the historical sites couldn't be easier. Being one of the region's largest tourist draws, there're a multitude of places to stay (and eat!) to choose from. Having visited the area a couple dozen times, there're no better accommodations than those offered by the Colonial Williamsburg Company -- for value, proximity and quality. The Colonial's clubhouse dates only to the 1990's, but its architectural style could go back much farther. Highly recommended is the new Williamsburg Woodlands Hotel, adjacent to Colonial Williamsburg's Visitor's Center, and just a short walk or bus ride away from the historic district itself. The Woodlands is part of Colonial Williamsburg's constant building and restoration effort -- and a fine example of the Foundation's efforts to provide the best possible stay for its guests. The Woodlands is a family-style hotel, complete with all the amenities you'd expect from a kid friendly environment. If you're looking for more formal sleeping quarters, try the Williamsburg Lodge, directly adjacent to the historic area (and also the Gold and Green Courses of the Golden Horseshoe), or smother yourself in luxury at the newly renovated Williamsburg Inn. It all depends on your budget and preferences -- and the nice thing is, it's available, and up to you! 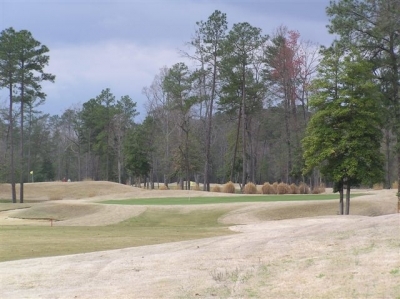 Note: See links below for reviews of other Williamsburg area golf courses and attractions. Rates: Seasonal, between $45-$69. Twilight rates available. All rates include cart. Rates also available for timeshare residents, groups and juniors. Walking permitted for members only. 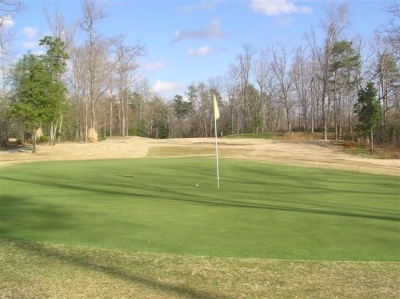 Excellent package deals available with other Williamsburg area courses.